Developer: Artech Digital Entertainment, Hasbro Interactive, Inc. It's the World's most Popular Board Game Brought to Life! Now you can create your own personal version of the famous Property Trading Game By Parker Brothers and play like never before. Incredible animation and real time 3-D action provide a unique gaming experience that allows you to see for the first time what properties really look like, watch tokens come to life and build an original version on a customisable board. Customise the board to your own town or theme for great family fun. Use the clip art, or your own images - the ideas are limitless! Play one of 12 international versions from Paris to Singapore or choose the classic board. Have fun with up to 6 human players, challenge the computer or show the world your real estate skills over the Internet. Engaging Original music scores and sound effects keep the action moving no matter how your negotiations are going while adding a fun detail to the tokens as they ski, hop and race around the board. Lifelike and vivid 3-D animation designed for today's PCs with updated features, so that you can trade, buy and sell properties in a whole new dimension. 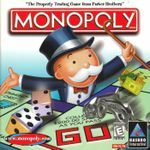 Play 'Classic Monopoly or use the 'quick game' rules.